Megan Stumpf, 6, attaches a missing sticker to her shirt while waiting in line for dinner Tuesday evening at Pine Valley Church in Bayfield during a benefit dinner and silent auction to support efforts to find missing 13-year-old Dylan Redwine. 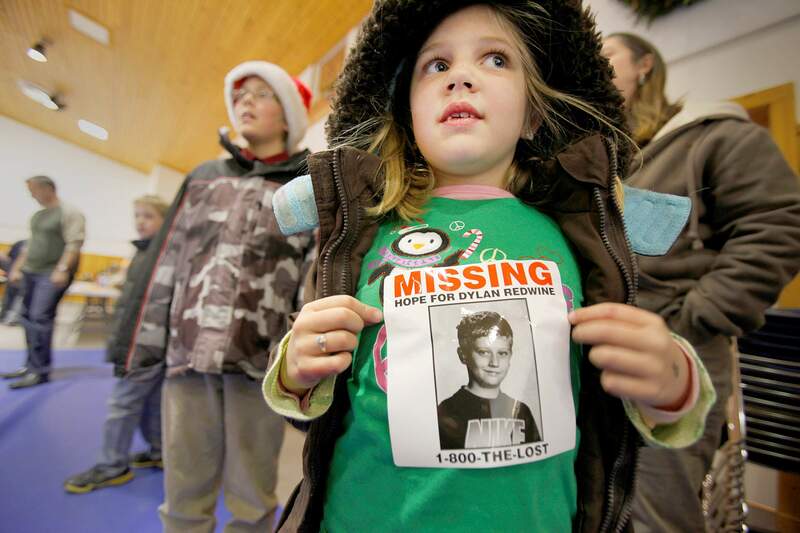 Megans brother, Colton Stumpf, was in the same grade as Dylan when Dylan attended school in Bayfield. Organizers estimated more than 800 people attended the spaghetti dinner, silent auction and raffle, an impressive number made all the more remarkable considering the towns population hovers around 2,000. One of the unofficial head cooks for the event, who didnt want to give her name, said she spent 48 hours cooking pasta. An Ignacio restaurant owner spent her only day off making 820 meatballs. Elaine Redwine, Dylans mother, was at the dinner and Cory Redwine, Dylans 21-year-old brother, flew in from Colorado Springs. Organizers didnt have a final tally of proceeds when the event came to a close, but Hess said all the money will go to the Find Dylan Redwine Fund. Nothing has been taken out of the fund yet, but Hess said it could be used for anything from hiring private investigators to offering a higher reward for Dylans return. Whatever it takes to bring him home, she said. The event was bittersweet for many of Dylans friends. Its hard that such a good event is being held for a very sad cause, said Chris Kane, an eighth-grader at Bayfield Middle School who remembered spending summers hanging out at the river with Dylan. Another friend, Caitlyn Phillips, had mixed emotions as well. Its hard searching and not knowing if hes coming back, she said.